Get your 1000bulbs.coma 500 Package today from PRIMESPORT, the Official Travel Partner of Talladega Superspeedway! Let PRIMESPORT handle your travel needs so you don't have to worry about a thing. First run in 1969 as the Talladega 500, now known as the 1000bulbs.com 500 is the second race of the year at NASCAR’s famed Talladega Superspeedway. The start of the second leg of the Chase for the Monster Energy Cup, a race that is just one shy of the record for most lead changes in a NASCAR event, and has gone to an extended finish 7 times, the Alabama 500 might be one the greatest races to watch on the NASCAR calendar. No one has raced at Talladega quite like the Earnhardt family. Dale Earnhardt holds the most title in this event having won 7 times beginning with the 1983 Talladega 500 and winning his last in 2000. In 2001 Dale Earnhardt Jr. picked up right where his dad left off winning the first of 3 career victories only months after Earnhardt was killed in a crash at Daytona. Between the two, the Earnhardt’s have 10 victories in the 1000bulbs.com 500, a feat unaccomplished by any other duo in Talladega history. Experience racing at NASCAR’s most storied track with an Official Travel Package from PRIMESPORT! 2019 1000bulbs.com 500 packages can include: Hotel Rooms, Race Tickets, Roundtrip Race Day Transfers, FanVision Rental, and Official Souvenirs. 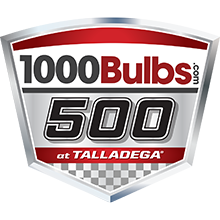 Get to the 1000bulbs.com 500 with an Official Travel Package from PRIMESPORT, the Official Travel Partner of Talladega Superspeedway.